The Arabic alphabet have intrigued Sameh Ismail for the most part of his artistic career and consequently shaped his painting practice: the form of the letter, the symbol, the meaning and the phonetic. Sameh Ismail's dual practice as a professional painter by rigorous formal fine art education--and musician/percussionist feed into each other. The sounds produced by music have led him to try to transcend the simple visual aesthetics of standard abstract painting; and as such he introduced visual elements that could be linked to sound. Arabic letters have entered his paintings as a recognized cultural form; visual element that could be pronounced or sung. As elements, Arabic letters moved with his brush strokes and further enhanced his abstract painterly techniques. The versatility of form of the Arabic letter- its 1500 years of vocalized and painted history, as well as the centuries-old visual culture of Khatt or Arabic Calligraphy- all worked to inspire Ismail as a painter. Joint exhibition with artist Mr. Hamdy Reda- El Manesterly Palace- Cultural Development Fund. Group Exhibition � El Falaky Gallery � AUC, organized by the artist Mahmoud Hamdy. Personal Exhibition � Atelier Al- Quahira. Group Exhibition- Qebab Gallery- Abu Dhabi- Emirates. Solo Exhibition- Gezira Arts Centre- Sector of Fine Arts. Group Exhibition for �Al Masaar Artists�, Al Noskha Al Oula Gallery. �A Dialogue on Railway� Project � Graffiti - in cooperation with the Austrian Graffiti artist Thomas Mock � organized by the Austrian Cultural Forum. Guest Artist for one month � Art Di Natura � Barcelona � Spain � Artellwa Contemporary Art Space. Group Exhibition � The Arab Calligraphers � Nabd Gallery � Jordan-organized by Al Masaar Gallery. Group Exhibition � Daeret Al Fenoun � Kuwait- organized by Al Masaar Gallery. Group Exhibition for Al Masaar Artists � Al Noskha Al Thanya Gallery. Group Exhibition - titled �The Body�- Al Masaar Gallery. Solo Exhibition � Al Gezira Arts Centre- Sector of Fine Arts. General Exhibition � Art Palace - Sector of Fine Arts. Group Exhibition � Articulant Babbon Gallery. Group Exhibition titled �Egypt the Mother� � ZAMALEK ART GALLERY. 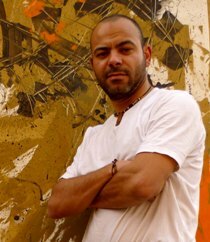 Graffiti, in cooperation with the Spanish artist Carlos Noreya � Articulat Babbon Gallery. Solo Exhibition - organized by ZAMALEK ART GALLERY- Kempinsky Hotel � Cairo. Art Fair � Marrakesh � Morocco, by Ward Cultural Foundation. Group Exhibition at (Fa) Gallery � Kuwait � by Ward Cultural Foundation. Joint Exhibition with Artist Mr. Hamdy Reda � Islamic Arts Festival � Sharjah Museum. Art Fair (Miami Palm Beach) USA by Seira Art Gallery. Group Exhibition at the residence of the European Union Ambassador in Egypt, organized by Aida Al Tarei. Commissar of the exhibition of contemporary art in Riyadh for the occasion of Silver Jubilee of the Egyptian- Saudi Cultural Relations. Sharjah Biennale for the Arabic Calligraphy 2012 Fifth Session. Group Exhibition at Washington DC- USA. At Seira Contemporary Art Gallery. The National Museum of Jordan. Four Seasons Hotel, Nile Plaza, Garden City, Egypt. Fairmount Hotel, Nile Towers, Egypt.